Sometimes a really solid little restaurant can be hiding in full view, waiting to be discovered by locals. Perhaps you, like us, have walked past the olive trees too many times. All along, Baritalia has been sitting in the corner beckoning us with hooded eyes and somehow we’ve missed the overtures. 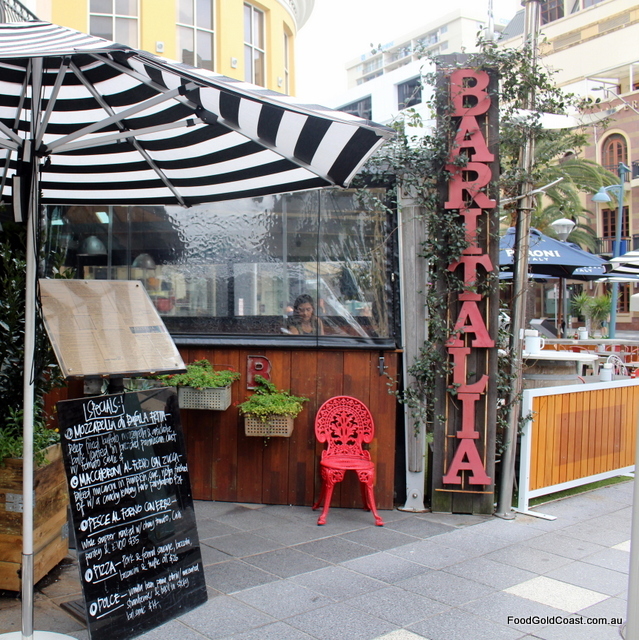 Located on a triangular corner of Elkhorn Avenue and Surfers Paradise Boulevard opposite the Clock Hotel, Baritalia lies in prime tourist territory. Although tiny inside, the restaurant has the luxury of three sides flanked by alfresco area, mostly undercover and facing northeast; a great position to catch both the winter sun and summer shade. 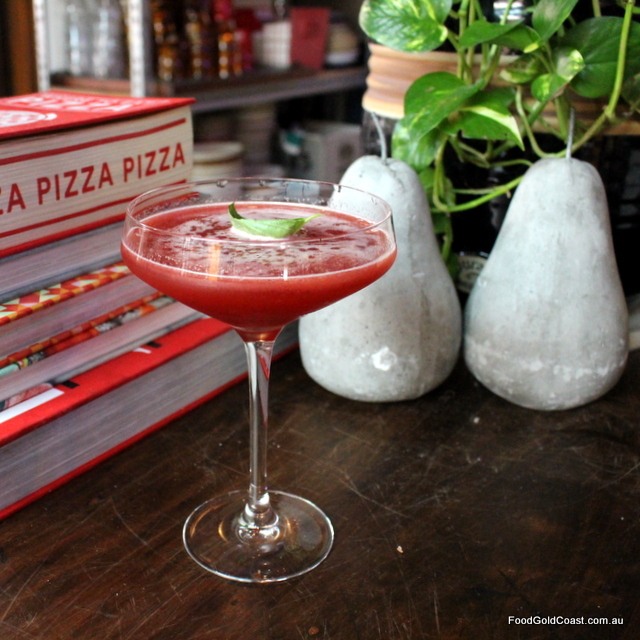 Melburnians Simon Vella and Stacey Cameron took over Baritalia in 2010. Simon’s experience as a chef and Stacey’s retail background were put to good use as the couple took the opportunity to move north and invest their savings in the restaurant. Slowly they transformed the venue as their vision for the restaurant slowly crystallised. Baritalia is now a welcoming restaurant decked out like a meandering urban Italian garden, inviting us to come in, sit and relax. Simon and Stacey have added their own quirky touches to make the restaurant feel like a home away from home: faux grass bench seats, a box of cookbooks on the table inside the entrance, plants (lots of them) wedged in doorways, standing against columns, on peg hangers in denim bucket holders, attached to doors in wire hangers, handmade tables (Stacey’s ideas, his work, Simon says, laughing)… It’s all very eclectic, but somehow it works, giving the laid back feel of a local village trattoria or urban garden with welcoming hosts. “We like to keep it really casual. It really reminds me of my Mum and Dad’s back yard when we were growing up – a touch of woginess, and lots of greenery. We spent our whole childhood in the backyard,” Simon adds. We’ve made ourselves comfortable in the ‘front yard’ overlooking the street. Time to check out the menus. We order a mug of coffee, a smooth rich chocolatey Di Bella Coffee Felici house blend from 100% Arabica beans, as we take our time with the menu choices. It’s early afternoon, so we overlook the breakfast menu and freshly squeezed orange juice, choosing our dishes from the Lunch/Dinner menu. It’s an all-encompassing journey through modern regional Italian cuisine: antipasti, pane, secondo, pasta e risotto, pizze, dolce and a supplementary lunch section of burgers, sandwiches and salads, with gluten-free and vegetarian choices clearly marked. All of Baritalia’s food is made in house bar the pasta, sourced from local producers Pasta Fresca, a couple renowned for their artisan fresh pasta and sauces. 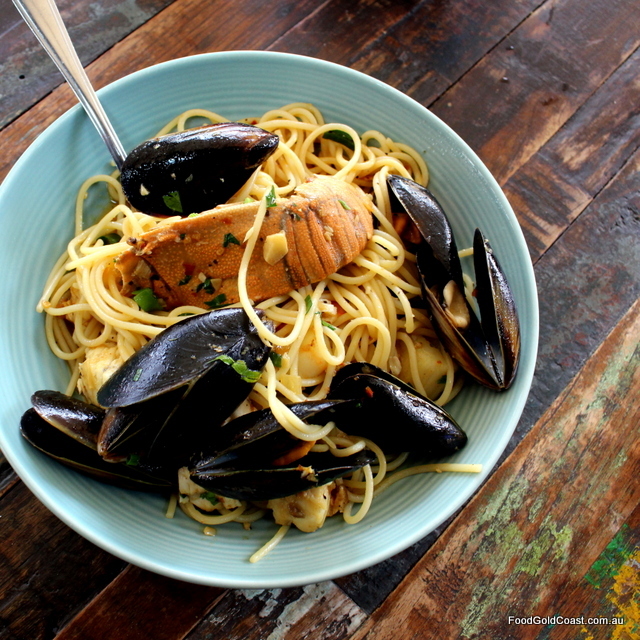 Fully licensed, Baritalia’s a great place to choose food to share with a drink: large bowls of chilli Tasmanian chilli mussels in a wine-laced saffron broth, platters of salumi to accompany drinks, or garlic king prawns from the local trawlers. 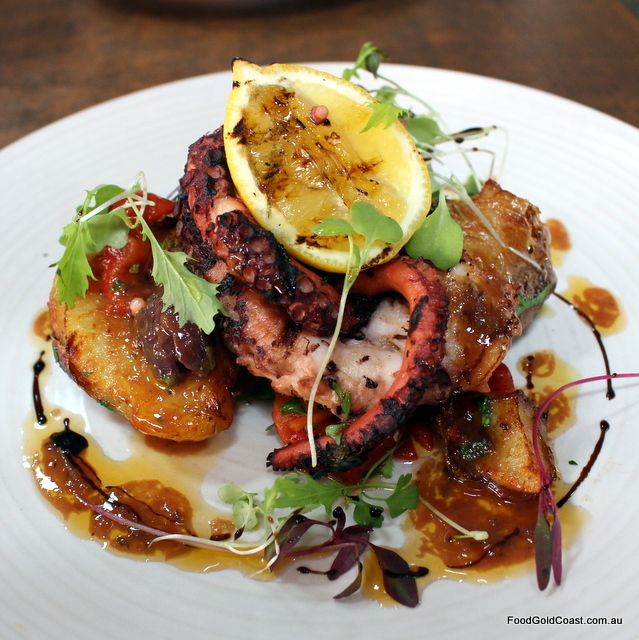 The mains contain rustic favourites such as Northern Rivers Veal scaloppini, a hearty Porchetta (roast pork stuffed and slow roasted, served with balsamic roast veg), and pasta dishes such as Pappardelle con Salsiccia (flat ribbon pasta with pork and fennel sausage and gorgonzola in a light creamy sauce). Oh yes, we could gobble that up! There are also specials on the blackboards around the restaurant. Simon tells me later that the kitchen staff originate from all around Italy, so they take turns choosing their own regional specialties to try as specials, putting their own special spin on each dish to make it their own. It’s a great way to judge which dishes are worth including on the regular menu. We’ve dining at lunchtime – a lighter meal for us, and as we’ve ordered some bread to start, a house-made flatbread topped with black olives and rosemary, I choose an entrée as a meal from the specials board: Mozzarella di Bufala Fritta – two deep-fried buffalo mozzarella and artichoke balls coated in a breaded parmesan crust with a tomato sauce ($15) – delicious! It’s a generous serve which could be a meal with a side salad ordered separately, or shared as entrée due to its size. Yes, that’s a keeper, Simon! Of course there’s room for cocktails as well – mine an Italian Sour. 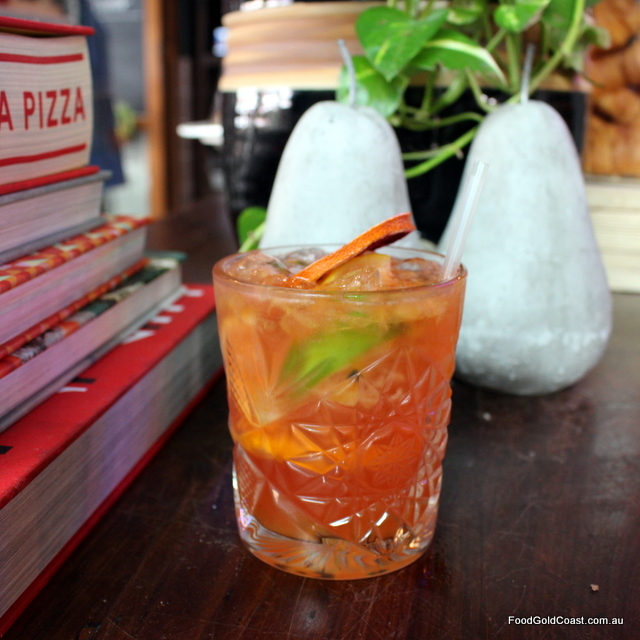 Simon tells us that he keeps campari, limoncello and aperol bottled for two weeks before blending with fresh lime, orange and lemon, topped up with passionfruit and blood orange. Deceptively refreshing, it’s the bomb on a lazy afternoon! The Main Squeeze orders Spaghetti al fruiti di Mare (Marinara) packed with prawns, black mussels, scallops, half a bug, fish and calamari panfried in garlic with a fresh tang of chilli in a tomato-based sauce laced with olives and EVOO ($35). It’s a hit, which leaves him silent, even when the Clock Hotel’s clarions strike the hour with Edelweiss in discordant tones. Mmm… It’s one of those Alice in Wonderland eccentricities that travellers often encounter, but it will keep younger family members enthralled watching the kangaroo, emu, koala and swagman parade around the clock as it strikes each hour to a different tune. The front of the restaurant is prime viewing territory! There’s no skipping dessert, as both Simon’s biscuits and desserts are well known. 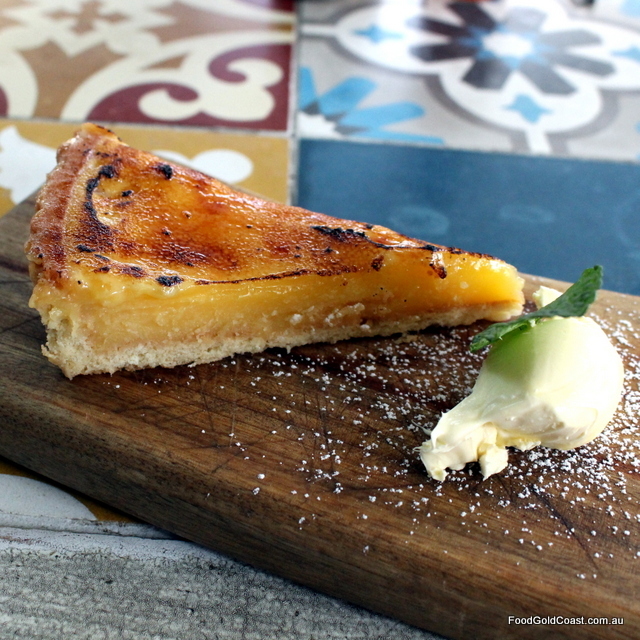 We pass the gelati, tiramisu and crumbles, choosing a Citrus tart with caramelised toffee top to finish our meal ($12). It’s deliciously light yet packed with flavour; the perfect tangy conclusion to a satisfying meal. 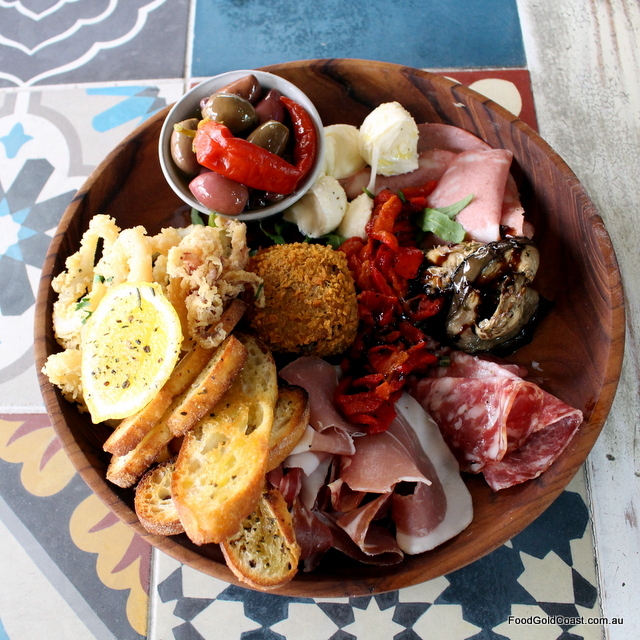 Family-friendly, Baritalia is a great place to stop, relax and take some time out of the concrete jungle. With two hours free parking under Chevron Renaissance, and the light rail only a block away, now there’s no excuse for missing out on Baritalia’s classic food with a modern twist. So come outside into the garden. 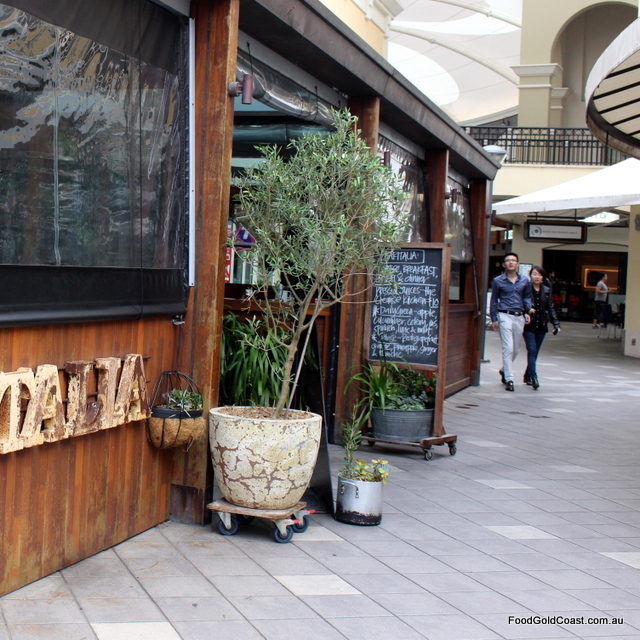 There’s a great Italian meal waiting just past the olive trees. 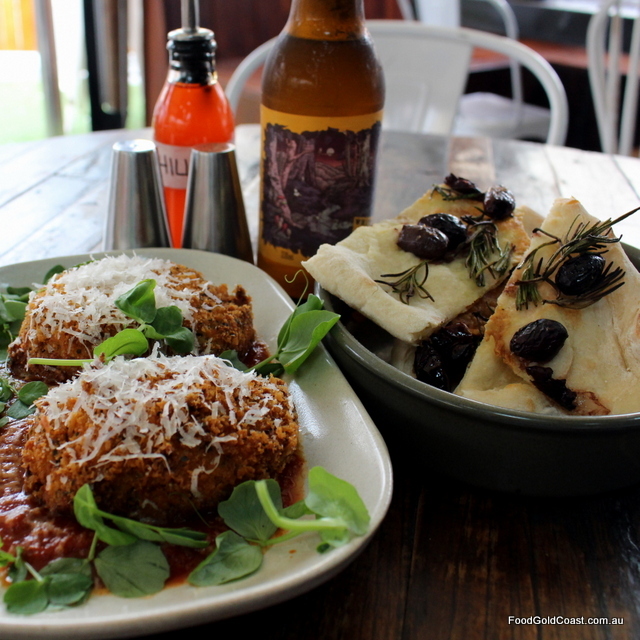 Note: Good Food Gold Coast dined as guests of Di Bella Coffee. October 2016: Baritalia will soon undergo a facelift!